You are here: Home / Amibroker / How to Create Your First Amibroker DLL Plugin? Who Should go for DLL Plugin? 1)By default Amibroker doesn’t have AFL source code protection mechanism. If you are planning to secure your secret mathematical model from others or license it and sell it to your customers. 2)Planning for Automation in Amibroker (Report Generation, Data Plugin Creation, GUI based automation). For Example TradeSender is amibroker automation program which push notification alerts to your Android Smart Phone. 2)Microsoft Visual Studio. You can try out the visual studio community edition if you are an individual developer and can create paid or free apps. And Organizations can use it for contributing to open source projects, Research or in a classroom learning environment. Visual Studio Community 2013 includes all the great functionality of Visual Studio Professional 2013, designed and optimized for individual developers, students, open source contributors, and small teams. 4)Knowledge on VC# or Visual Studio and SDK concepts. 1)Download the Dot Net SDK for Amibroker according to your 32bit or 64bit Amibroker Edition and Amibroker Version. 5)After Pressing OK it opens the default sample template which is nothing but a simple moving average function as shown below. Instead you can write your own custom functions which has to be hidden from the public. This attempt will create the dll plugin files under /Amibroker/.Net for Amibroker/Assemblies where are your converted dll files has to be placed. The Build attempt It also creates the converted AFL file which refers the dll secret functions. The AFL files are stored under /amibroker/formulas/.Net for Amibroker/SimplePlugin as shown below. You can notice that now SimplePluginFunc1(Close, 5); is highlighted in blue text which means amibroker recognizes the function now and refers the custom dll files. For creating your own custom functions it is recommended go thro the tutorials in .Net SDK for Amibroker. It is recommended to be familiar with Amibroker, Visual Studio(C#, VB.Net) and .Net SDK Functions. can we call ninja DLLs in amibroker AFLs? as it is a DLL only. No you cannot use the Ninja DLL’s in Amibroker as it Support only Ninjatrader Functionality. Cross Porting is not possible between Ninjatrader and Amibroker. Nice one, i think if any one is not friendly to coding software skills can use it. Great Work. Could you share more info on making great strategy with a good accuracy and also when you are planning your session in Ahmedabad. Sure the blog mostly focus on strategy which has atleast little edge in the market. As of now this year it is concerned we are not planning in Ahmedabad. When blog is focusing on Strategy development,I am putting an idea to it. Is it possible to develop any good strategy and Scanner based on tape reading analysis in Amibroker5.80/5.90 32bit with backtesting and forwardtesting option in one click ? thanks in advance And waiting for your comments. very helpful……will give it a try………thanks alot. can you please explore how we can add ami-broker template to visual studio 10 i tried it several time to do but failed. i am not able to find amibroker template for visual studio. can you please tell me how can we install amibroker template to visual studio 10.
i am not able to find ami broker template in visual studio. 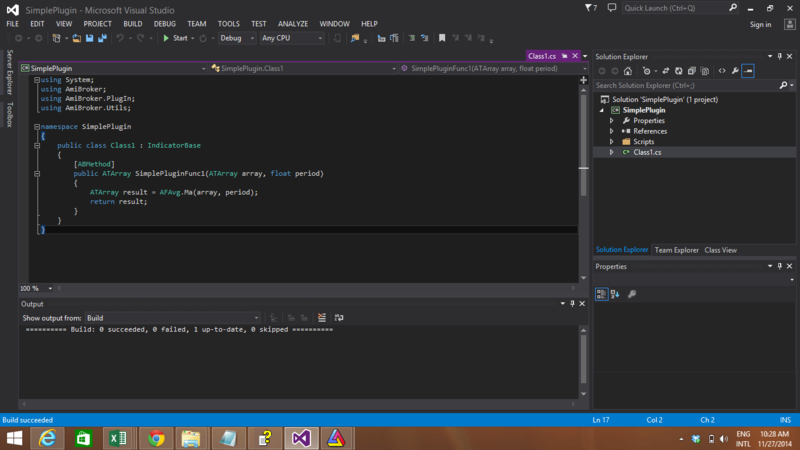 2)Open Visual Studio-> Goto New Project. i completed step 1 but i got stuck at step 2. I have a “n reversal afl ” it gives late signals if you modify or deveplope exact signal , how can contact you Sir. AFL is a limited language in the sense that it doesnt support everything that a high level programming language like C++ or Java supports , like there are no Classes . I want to write a stragey thats pretty complex and with my attempt with so far with AFL its been difficult because of various limitations of AFL , like limited data types. Can these be overcome with the help of plugins ? can we write classes in plugin ? Recently sharekhan have provided api access to me . Now i want automatic order placement in trade tiger from amibroker. i have taken the trail of GFDL plugin.. but issue is that they only provide futures segment data and no cash market data. So i cannot trade using same plugin in cash market. so i am trying to make my own plugin. So please help me if you can. I can be part of your project, but i dont have programming knowledge, how can i include in it. Firstly, Thanks for educating us. I have tried creating the sample project as mentioned above. but amibroker is not recognizing the function SimplePluginFunc1(Close, 5); Please let me know what could be the issue here. did this work for u ? I have downloaded visual basic from the link in the article -- but amibroker plugin in not available. How do get it, please advise. Also I downloaded visual studio first then dot net. Hope that is not the prob. Would appreciate your reply -- m trying to convert my afl code to dll. Do know about any MT4 Robotrader Software for Indian Market? Please guide what can be the issue.